The goal of the Euclid + Market Complete Streets project is to upgrade the Euclid Avenue and Market Street corridors to safely accommodate vehicles, public transit, bicyclists and pedestrians through the design, construction, and maintenance of infrastructure improvements that include new and expanded sidewalks, bicycle facilities, crosswalks, medians, and curb extensions to calm traffic. 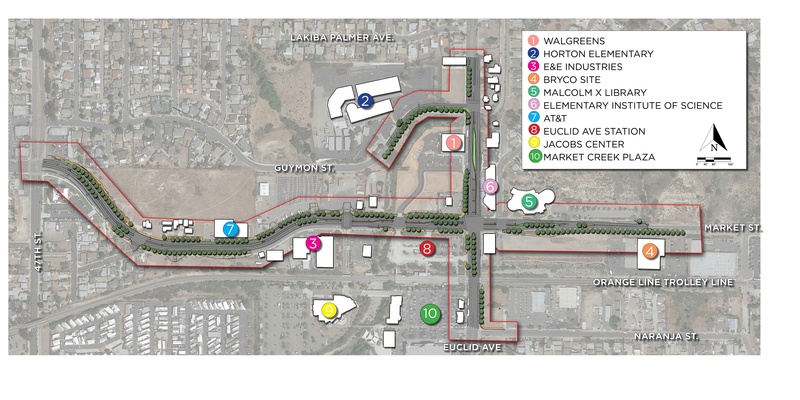 These efforts will help revitalize the neighborhood by calming traffic, reducing vehicular collisions, improving air quality, beautifying the streetscape, and improving the overall health of residents by encouraging walking and biking. This project is funded in large part by a Caltrans Active Transportation Program grant. For more information contact Liz Faris, Communications Manager at lfaris@jacobscenter.org or 619.527.6161 ext. 376.